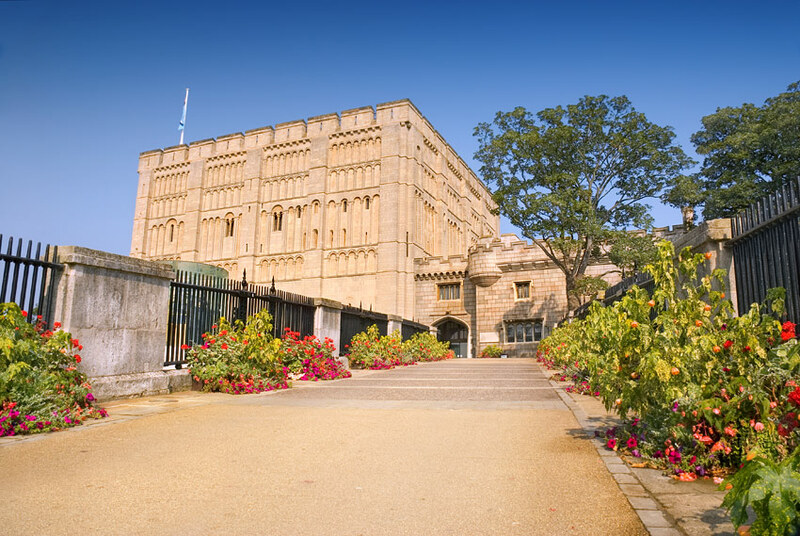 Norwich - Your guide to this historic city full of discovery! There is nowhere you can go in the ancient medieval city of Norwich that is not interesting. The centre of gravity has shifted from time to time but every part, almost every street, has had its moment in the sun, historically speaking. This tourist Norwich Map highlights some of the most popular places to visit during your stay in Norwich. Use the map by clicking on the pin icons to reveal tourist attractions, car parks and accommodation options. Norwich is the most complete medieval city in Britain. 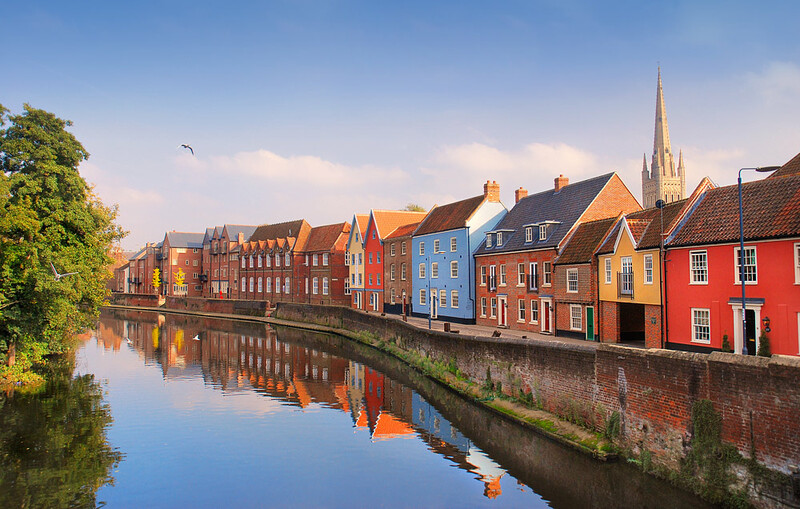 It has, for much of its 1500 years been almost a separate kingdom – you don’t go through Norwich to get to another important city or area – and this relative isolation has resulted in a mixture of architecture, character and customs that is unique. Almost every street has beautiful buildings wherever you look – up, down or straight ahead. There is an ‘odd’ balcony here, a beautiful gable there, and somewhere else an intricate footscraper or lovely doorway. If you are interested in old crafts, come see the original Town Hall with its squared flints or if you like to travel back in time, walk along Gentleman’s Walk below the market where Regency Beaus used to parade up and down in their best finery. We are spoilt in Norwich, having so many buildings, mostly ancient but some modern ones, too, that are exceptional and so perhaps the architects (Charles Holloway James and Stephen Rowland Pierce ) were on a hiding to nothing when trying to please everyone. Norwich has given birth or education to many eminent people – among them Baroness Amos, Admiral Nelson, Edith Cavell, Stephen Fry, Delia Smith, Kazuo Ishiguro, Ian McEwan, George Borrow and John Chrome. Some famous industries have started here, too, including Coleman’s Mustard, Caley’s Chocolate, and Boulton and Paul who produced more Sopworth Camels in the First World War than anyone else. There are two inspiring Cathedrals and churches so grand, like St Peter Mancroft, opposite the Forum, that some visitors mistake them for the Anglican Cathedral. Then, there are churches that have been converted to other uses and some, sadly, that no one can work out an everyday use for. All, though, were the work of generations of families who laboured on them for the glory of God. They are quite exquisite and have many stories to tell. There has been a settlement at Norwich since the 5th-7th centuries. 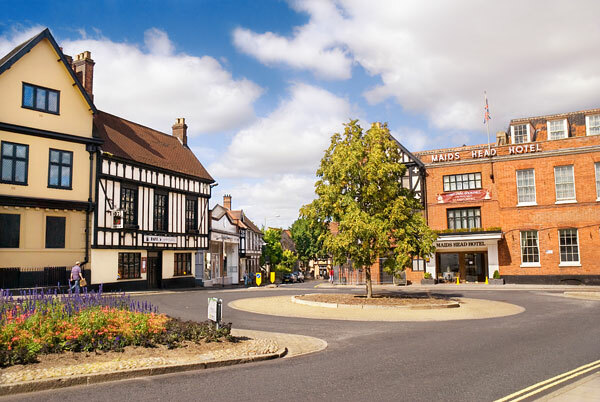 Named Northwic it slowly grew to become one of the most important towns in Anglo Saxon England, thanks to its rich agricultural land and close proximity to the River Wensum and River Yare – perfect of course for trade. Following the Norman Conquest, Herbert de Losinga was required by the Pope, as an act of penance for the serious moral crime of ‘buying’ the Bishopric of Theford – he paid nineteen hundred pounds, a colossal sum – to build a Cathedral adjacent to Tombland. He also built a Benedictine Monastery here. The first stone was laid by him in 1094. Tombland, which has nothing to do with ‘tombs’ but derives from the Norse word ‘thum’ meaning ‘empty space’, became the new centre of the city with a thriving market. The soaring proportions of the Cathedral Church of the Holy and Undivided Trinity, with its thousand roof bosses and compelling pristine spirit, has remained the chief glory of this city, even though the ‘busyness’ of life is best manifested nowadays in other parts. Her Majesty Queen Elizabeth II is, at the very moment of writing, opening the new Hostry, the largest building project in Norwich Cathedral’s history since its inception. It has been 11 years in the making, and is designed by Sir Michael Hopkins. The nearby Castle was also built at this time. The Normans wanted to impose their authority on those who may be tempted to oppose them. It is a fine structure, of Caen stone, resurfaced in Victorian times. Kett was hung in chains over the walls of Norwich Castle following his rebellion in 1549. Yet, it never had a monarch live here. It has a fascinating museum inside, which includes a 19th century bird collection, a wonderful array of paintings by the ‘Norwich School’ – notably John Crome and John Sell Cotman – and a world-beating display of ceramic teapots. King Street, just down from the Castle was, during this period, the most important street in the city. Slightly later, Elm Hill – at the other end of Tombland – became fashionable. It was the home of many prosperous merchants and civic personalities, including the Paston family who bequeathed us the Paston Letters, which is still in print. Thereafter, Elm Hill fell into decay and was only saved from destruction in the early 20th Century by a single vote of the Council. Today, for most people going about their everyday business, the centre of town is the Market Place. This has been the ‘social’ hub of Norwich since, probably, the 18th Century. At the bottom of the square is the wonderfully named Gentleman’s Walk. The male of the species was, in olden days, the ‘Peacock’. Dressed in silk waistcoats, with wigs suitably powdered, gentlemen would try to attract the ladies and also celebrate the fact that they were masters of the universe by parading up and down Gentleman’s Walk, dropping into the many coffee houses for a chat with their peers. It is interesting that the term ‘Tuck Shop’ – evidenced in public schools all over the Empire – may have originated from ‘Tuck’s Coffee House’ which was an attraction here. It had a library of sorts and the latest papers, along with sweets and delicacies to be enjoyed. The Market Place has recently been revamped and all stalls replaced in line with current trading laws. The vibrant coloured tops of the units have been retained. It is always changing as it is a crucible of modern retail ideas: thus we have a unit trading in Polish food, another in fine coffees, one specialising in Norfolk cheese and ice cream, and look – here’s one that sells strawberry and avocado soap! It is great place to propose a new business without the crippling overheads of a shop in an established street – and Norwich people are very enterprising. Thus, if you want to see the next ‘big thing’, you can do worse than wander about this market. The Millennium Library at the top of the Market Place is a very fine structure, horse-shoe shaped, designed by Sir Michael Hopkins and built of hand-made bricks. As well as books, you can have a pizza or beer here, take out CDs and films or research your family history. It is very friendly with helpful staff – the building as a whole is called ‘The Forum’, which means ‘meeting place’ in Latin, which is just how many citizens use it. Proud to relate, it is the most successful library complex in the country which is as it should be, Norwich having pioneered a ‘book-lending’ service more than four hundred years ago. The area in front of the Forum has lately been redesigned as a modern version of a small Greek amphitheatre. There are bands here; and all sorts of exhibitions. All over the steps will be citizens eating and drinking, mostly food from the market. Just below the Forum, in Haymarket, is a statue of Sir Thomas Browne , one of the most influential gentlemen in Norwich’s history. He wrote Religio Medici, a work of international renown concerning the raison d’etre of the medical profession. He was knighted by Charles II in 1671. Gentleman’s Walk is packed with high street names and the thousands of daily shoppers that use them. The name Gentleman’s Walk originates from the gentleman of the 18th Century who used the area for their daily adventures, which more than often involved drinking in the many inns that existed. 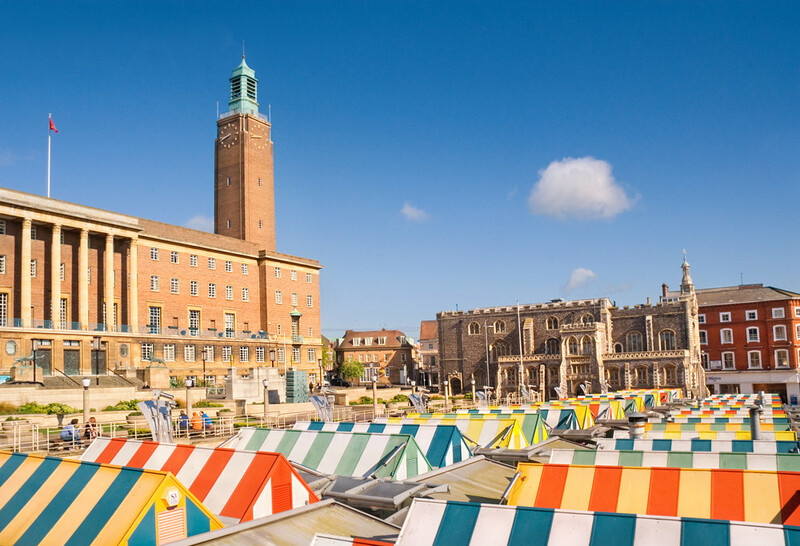 Street entertainment and buskers are often found in Gentleman’s Walk, which is also home to the colourful and friendly Norwich Market – the largest open air market in England! St Stephen’s Street is home to many high street stores and provides access to Chapelfield shopping complex. Chapelfield Norwich was opened in 2005. A survey by a major credit card company in 2006 put Norwich city centre as number 1 in the UK as regards customer satisfaction. Chapelfield Centre is on the site previously occupied by Caleys chocolate, at one time a famous Norwich company. The Norwich Lanes. From City Hall Clock Tower cross the road, pass the Guildhall and you’ll find yourself at the top of Lower Goat Lane. Head down here and you’ll enter the Norwich Lanes – home to numerous cobbled lanes and streets, quaint independent shops full of charming character. It’s a wonderful place to visit and an ideal escape from the busy high streets. 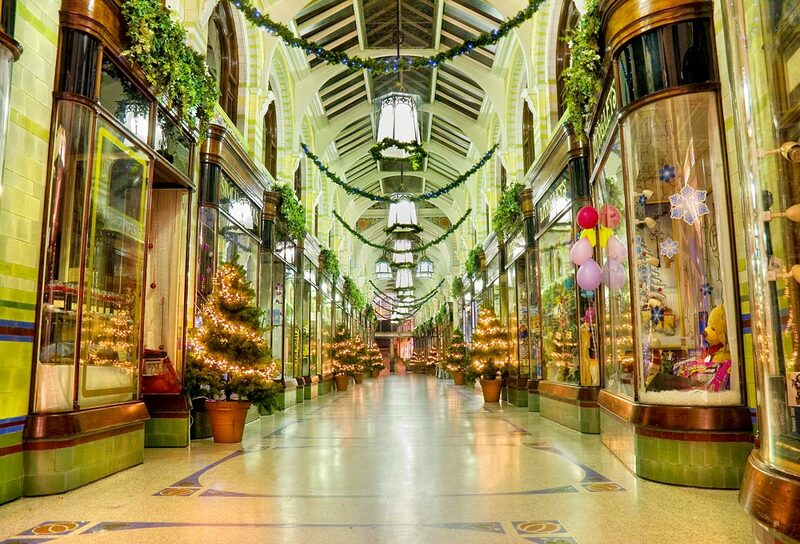 Between Gentleman’s Walk and Castle Street you will find the Royal Arcade designed by George Skipper in 1899. Arcades like this were the forerunners of today’s big shopping malls. It was restored in 2001, and contains some of the finest art nouveau stained glass, sculpture and tiles in the country. There are a multitude of designated parking spaces in Norwich city centre, mainly hosted by various large multi story carparks throughout the city. 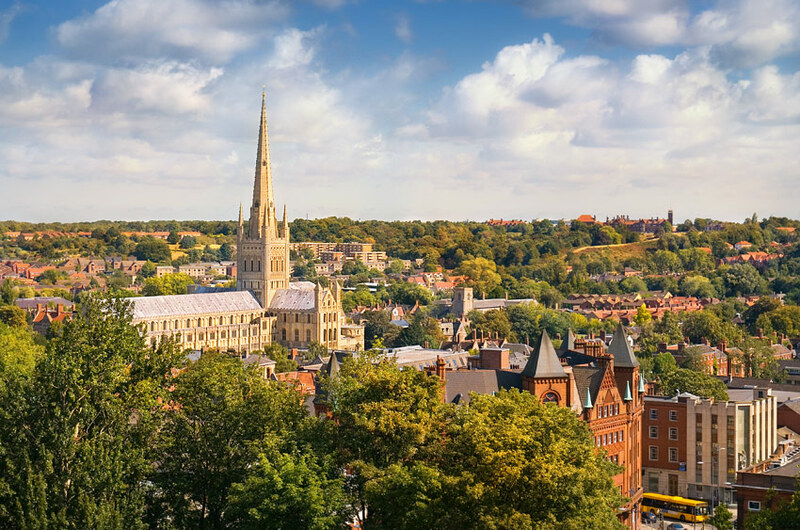 For locations and availability try our Norwich Parking Spaces Live availability system – updated every 5 minutes, it tells you exactly where to find available parking spaces in Norwich! For those who don’t fancy a drive into Norwich city centre, try the Norwich Park and Ride availability system. 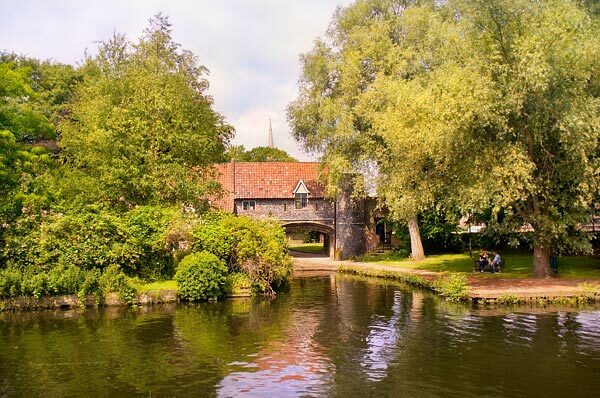 If you are in need of some peace and quiet, try a stroll along the River Wensum. 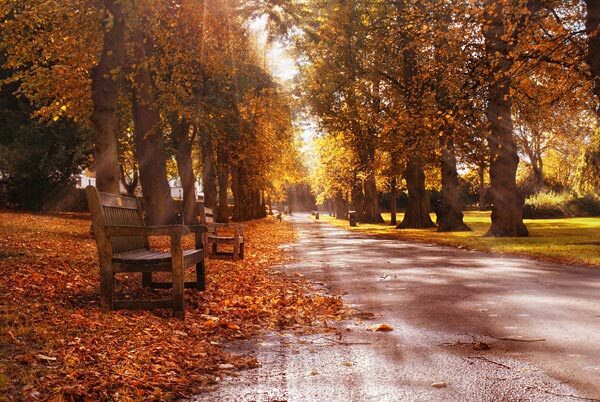 This beautiful walk in Norwich is perfect for the summertime and provides some lovely postcard scenes. Norwich Cathedral is one of the finest architectural and spiritual treasures of Europe plus a Close of over 44 acres containing 83 Grade 1 or 2 listed buildings. The Cathedral was completed in the 12th Century and is built from limestone brought in from Caen, France. The spire is the second tallest in England and was originally made from wood. This did not fare well in strong storms and was rebuilt several times before the stone one seen today was constructed in the late 15th Century. Pull’s Ferry is a flint building, once used as a medieval watergate. During the 12th Century, monks built a canal from the River Wensum to Norwich Cathedral, where Caen stone was transported for building the cathedral. Thereafter, the inlet was used to bring in provisions and, for at least 400 years, a ferry operated here. The keeper of the ferry was appointed by the Dean and Chapter and records show that in 1642 a man named Sandlin had the job: the ferry is presently known by the name of the last operator in the 1930s. Norwich Castle was built around the time of 1100 on the instructions of William the Conqueror, to replace a Norman timber castle keep. Steeped in history it stands at over 70 foot high, and has had many uses in the past including a royal palace, a gaol, and more recently a museum showcasing historic artefacts and fabulous art galleries. The Roman Catholic Cathedral of St John the Baptist is Norwich’s second cathedral! It is mesmerising and fabulous place, more than anything the vision of one man – Henry, 15th Duke of Norfolk. It was constructed between 1882 and 1910 and is an incredible sight up close; it is particularly spectacular illuminated at night. Cow Tower next to the River Wensum is a symbolic reminder of Norwich’s medieval past, with its name deriving from grazing cattle that used it as shelter. In the 14th Century, Norwich had completed construction of its city walls, around 2 and a half miles in length. Built to keep the enemy out, much of the remains, including Cow Tower, and other towers can still be found in today’s modern city. 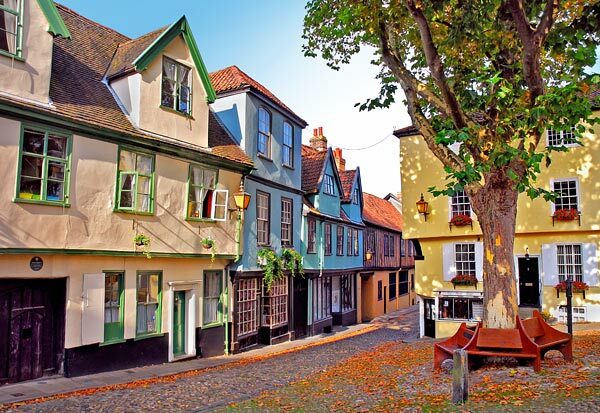 Elm Hill is a historic beautiful cobbled lane with buildings dating back to Tudor times. Today, it’s pretty coloured buildings are home to numerous antique shops and art galleries. The Forum is a £65 million pound building built on the site of the former Library, which was sadly destroyed by fire in 1994. Today the Forum is home to not only the library, but also a café, bar and restaurant, a tourist information centre, an art and gift shop, and hosts regular exhibitions. The Forum is a truly wonderful experience where you can easily lose all track of time! The Victorian Plantation Gardens. These beautiful gardens are situated next to the Roman Catholic Cathedral. Often called Norwich’s ‘secret gardens’, they do, indeed, have a magical quality and, as you enter, the 21st century gives way to the 19th. Run entirely by volunteers, you can join the Trust and help out if you like. Else you can simply pay a yearly subscription to help defray costs. Sir Roy Strong is Patron. The River Wensum. 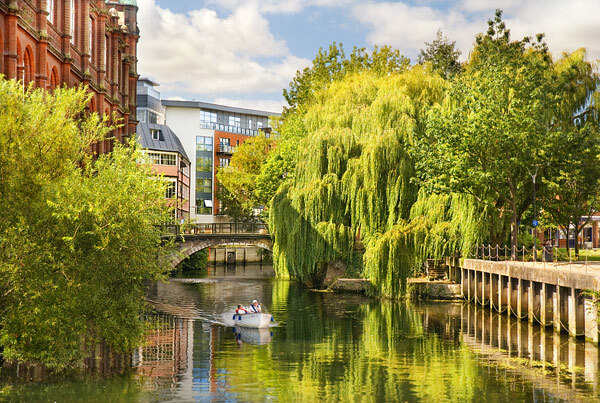 A short walk from the railway station brings you to the River Wensum that meanders around the north and east sides of the city centre. 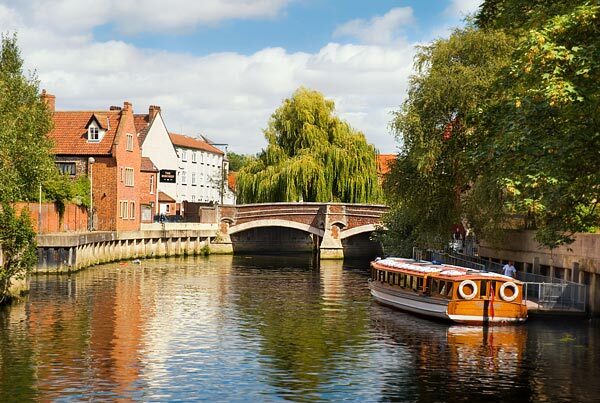 It has beautiful riverside walks and seasonal boat cruises, with views of Norwich Cathedral and Cow Tower. Tombland is neighbour to Norwich Cathedral and was once the setting for a Saxon market place. It is now rich with restaurants and bars and despite its grim sounding name, Tombland actually translates to “Open space”. It is reported to be the most haunted part of Norwich! Norwich Guildhall was built in the 15th Century and has been a host to court rooms, prisoners and more recently, tourists. St Julian’s Shrine. The Church of St Julian is located between King Street and Riverside and the cell of Lady Julian can be visited today. In 1373, recovering from a grave illness, Lady Julian received 16 visitations from God. She subsequently wrote these in the first book to be written in English by a woman, The Revelations of Divine Love, a book, furthermore, which has been in print ever since. The Market Place, for most citizens the centre of the city. Chapelfield Gardens is a peaceful green area on the outskirts of the city centre that neighbours the Chapelfield shopping complex. It provides the perfect place to relax after a busy shopping trip, or take the family on a picnic where you might be fortunate to hear a brass band playing in the band stand! The Gardens date back centuries: the compulsory archery practice on Sundays would have contributed to the famous victory at Agincourt in 1415 where the commander of the archers was celebrated Norwich citizen, Sir Thomas Erpingham. His effigy can be seen in prayer above the gate to Norwich Cathedral that bears his name – he is kneeling in prayer, thanking God for having spared his life. The Great Hospital, founded in 1249 by Walter de Suffield and still doing good today. Mousehold Heath – location of Kett’s last stand and with fabulous views over the whole city. You can also, like George Borrow, walk for hours on the Heath, most of which is behind you as you look towards the Cathedrals. 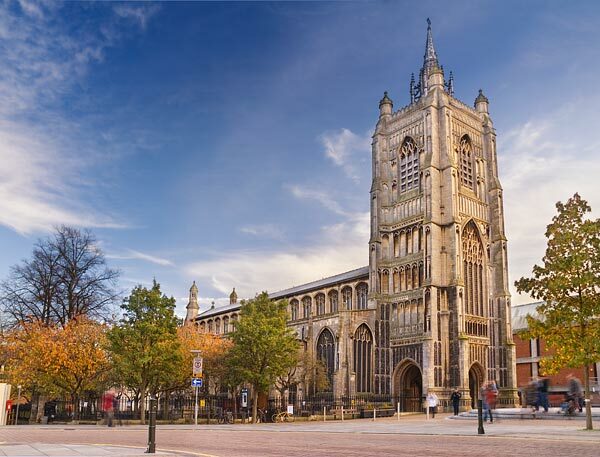 Norwich has 31 beautiful medieval churches. Unfortunately, only 9 of these are used for regular worship, although some have been converted to other uses. There used to be more. We have no idea how many there were 1500 years ago as they were generally made of wood and were constantly being destroyed, pulled down and put up somewhere else. Much better records were kept when flint and stone came to be used in the construction, and we know that, prior to 1500 AD, Norwich was legendary for having more churches that London, York and Bristol combined, as many as 53. St Peter Mancroft, opposite the Forum. The first mystery of this exceptionally fine church is the name – there is no St Peter Mancroft. Probably no-one knows with absolute certainty – the name derives from ‘Magna Crofta’ which means ‘Great Meadow’, upon which the church was built in the years 1430-55. The ‘Saint’ part probably derives from the original name – St Peter and St Paul. Thus: ’St Peter on the Great Meadow’. There are 14 bells which ring one of the finest peals anywhere in the world. Many times have the bells rung out to celebrate important events in history – we know, for example, that the citizens of Norwich were thus alerted to the defeat of the Spanish Armada in 1588. Norwich Pubs – Brewing has been linked to Norwich for many hundreds of years. There have always been a lot of pubs – in the 1850s over 600 and even in the 1980s about 200 remained. In October 2008, there were still 231 licensed premises in the city to suit every taste. The Rosary Cemetery. This is a very special place, unknown to most, that encapsulates much of the city’s history. It is a five acre plot full of beeches, oaks and chestnuts and, in spring, a mass of bluebells, that is managed with a touch just light enough to keep nature permanently and beautifully on the verge of rampage. In this haven of Victorian peace, only a short distance from the railway station, are buried some famous Norwich people: Jeremiah Colman, John Jarrold, RH Mottram and, more ostentatiously, John Barker, Steam Circus Proprietor, who was killed in an accident on April 12th 1897; along with the great and the good of Victorian society – Norwich Sheriffs, Mayors, artists and important men of industry. It is very tranquil, with the only shock likely to come from a squirrel suddenly springing from one tree branch to another perilously close to your head, almost as if he is playing with you. University of East Anglia, perfect for study but also incredibly beautiful with the Broad, thick woods and pathways by the River Yare. You will spot lots of fish, wild flowers in hues of yellow, mauve, blue and magenta, dragon flies and (extremely) fat rabbits.